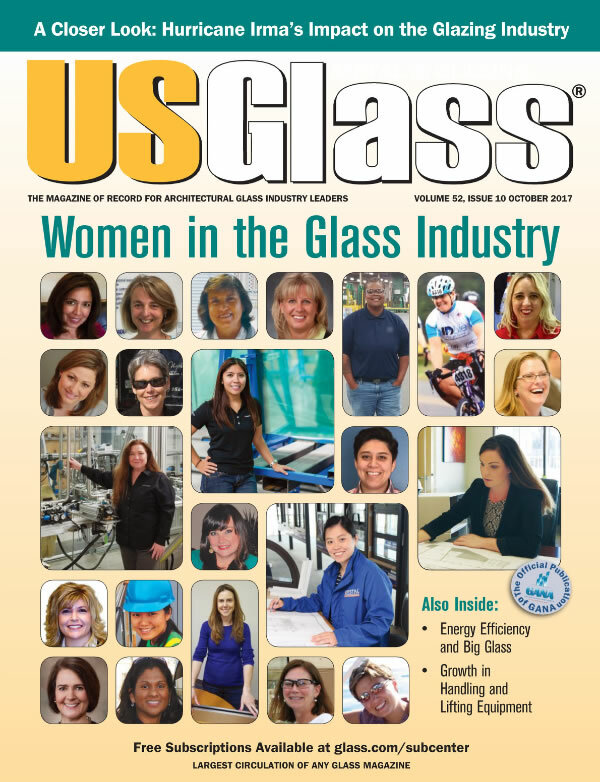 UsGlass recognized Nancy Mammaro, CEO & Founder of Mappi International and Mappi America one of the most influential women in the glass industry. Most of them didn’t set out to work in the glass and glazing industry, but they’re here and making an impact. These women are leading companies, sales teams, developing businesses and managing a host of other responsibilities. They’ve learned from their own heroes and mentors, and today they’re paving the way for more women to find opportunity and growth in this industry—one that (as many here point out) is struggling to find and keep aviable workforce. 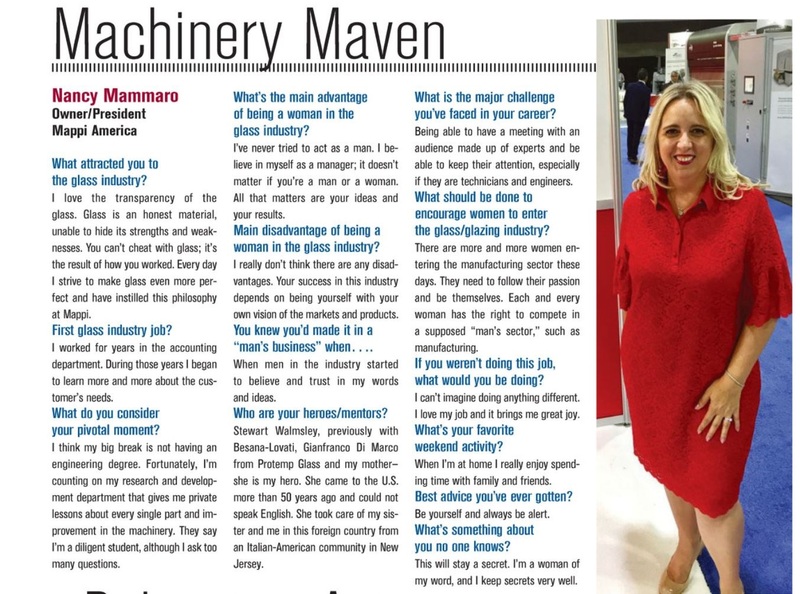 Here's interview with Nancy Mammaro, about her story; what brought her into the glass industry and what kept her here. What was her pivotal moment and what are her greatest challenges? She also shares insight into what we, as an industry, can do to encourage more women to seek out careers in this field. What attracted you to the glass industry? I love the transparency of the glass. Glass is an honest material, unable to hide its strengths and weaknesses. You can’t cheat with glass; it’s the result of how you worked. Every day I strive to make glass even more perfect and have instilled this philosophy at Mappi. I worked for years in the accounting department. During those years I began to learn more and more about the customer’s needs. What do you consider your pivotal moment? I think my big break is not having an engineering degree. Fortunately, I’m counting on my research and development department that gives me private lessons about every single part and improvement in the machinery. They say I’m a diligent student, although I ask too many questions. What’s the main advantage of being a woman in the glass industry? I’ve never tried to act as a man. I believe in myself as a manager; it doesn’t matter if you’re a man or a woman. All that matters are your ideas and your results. Main disadvantage of being a woman in the glass industry? I really don’t think there are any disadvantages. Your success in this industry depends on being yourself with your own vision of the markets and products. You knew you’d made it in a “man’s business” when…. When men in the industry started to believe and trust in my words and ideas. Stewart Walmsley, previously with Besana-Lovati, Gianfranco Di Marco from Protemp Glass and my mother— she is my hero. She came to the U.S. more than 50 years ago and could not speak English. She took care of my sister and me in this foreign country from an Italian-American community in New Jersey. What is the major challenge you’ve faced in your career? Being able to have a meeting with an audience made up of experts and be able to keep their attention, especially if they are technicians and engineers. What should be done to encourage women to enter the glass/glazing industry? There are more and more women entering the manufacturing sector these days. They need to follow their passion and be themselves. Each and every woman has the right to compete in a supposed “man’s sector,” such as manufacturing. I can’t imagine doing anything different. I love my job and it brings me great joy. When I’m at home I really enjoy spending time with family and friends. Be yourself and always be alert. What's something about you no one knows? This will stay a secret. I'm a woman of my word, and I keep secrets very well.